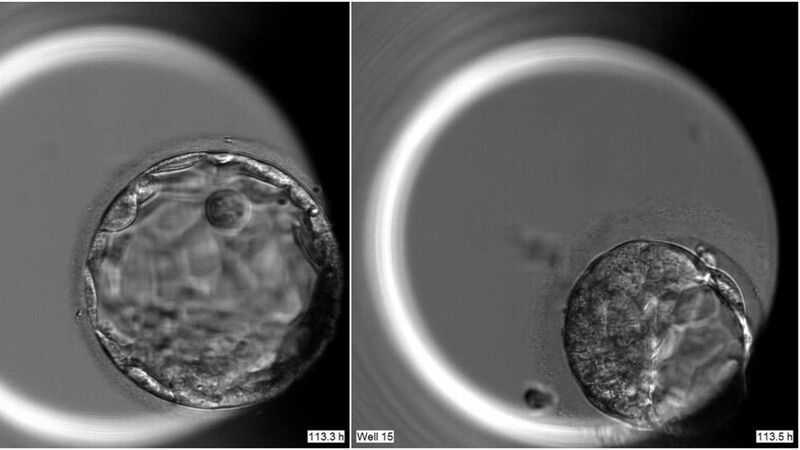 Human embryo on the 5th day of development with OCT4 function in tact (left) and without. Credit: Kathy Niakan / Nature. The first few days after a sperm fertilizes an egg are critical for a developing embryo — and not well understood. In a study published today in Nature, scientists in the U.K. report that by using a CRISPR gene-editing tool they've confirmed the essential role of a particular gene in progressing a pregnancy. Why it matters: It's the first time genome editing has been used to study the role of a gene in human embryos. Until now, scientists have been limited to studying these earliest moments in mice. In a briefing, study author Kathy Niakan from the Francis Crick Institute said she hopes further understanding of the genes involved in development can be used to improve stem cell biology and IVF treatment. "The knowledge that we gain from how human embryos develop within this first window of seven days can also help us to understand some of the causes of when pregnancy fails." Yes, but... The researchers also write they "cannot be certain that the early developmental arrest is associated with the loss of OCT4 rather than some non-specific effect" of the editing procedure. In other words, they can't rule out that their finding wasn't due to their method. What's happening: When an egg is fertilized, it begins to divide and about five days later reaches a ball of about 200 cells. From there, some of the cells go on to become the placenta, yolk sac and fetus. That differentiation is a critical stage — in IVF treatment, 50% of embryos fail to reach it — and the twenty cells that then form the fetus are of intense interest to scientists. What's next: Niakan hopes to determine exactly how and what the gene is controlling in embryo development and to see other scientists use it to study the role of other genes in the process. This story has been updated to clarify the limitations of the study.